The latest entry in the Diablo franchise continues the series' proud tradition of getting a 15 ratings. The eagerly awaited Diablo 3 has earned itself a 15 rating in the UK, courtesy of the BBFC. As usual, the rating is a little short on information, although it does reveal that the game has "moderate bloody violence" - which will surprise no one - and a little over half an hour of cut scenes. It's unlikely that long time Diablo fans will be surprised by the rating. While neither the original Diablo, or its sequel Diablo 2 were rated by the BBFC, they both received 15+ ratings from ELSPA - or the Entertainment and Leisure Software Publishers' Association, which has since become UKIE - and a 16+ ratings from PEGI. Similarly, both previous games have received the same rating from the ESRB - Mature - and Diablo 3 probably won't be any different. I don't disagree with the rating at all - everything I've seen about the game suggests that it's entirely correct - although I do think that a game in which monsters actually burst only has "moderate" bloody violence. 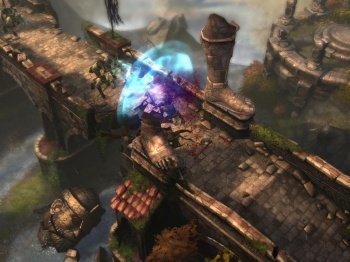 Diablo 3 is scheduled to come out for PC at some point early next year.